Serve punch and soda pop in reusable, 14 ounce frosted plastic graduation party cups. These reusable cups are dishwasher-safe and custom printed with a fun graduation design so guests can take them home as party souvenirs. Personalize your cups with a design and up to three lines of custom text. Each cup will hold up to 14 ounces when full to the brim; comfortably holding about 12 ounces of liquid. The ideal size for cocktails or punch. Great quality and looks beautiful! These cups was very beautiful good quality cups there was a hit at the party. The printing is also high quality I have washed them a couple of times and there still in good standing. Cups are great and exactly as shown. Great customer service also. 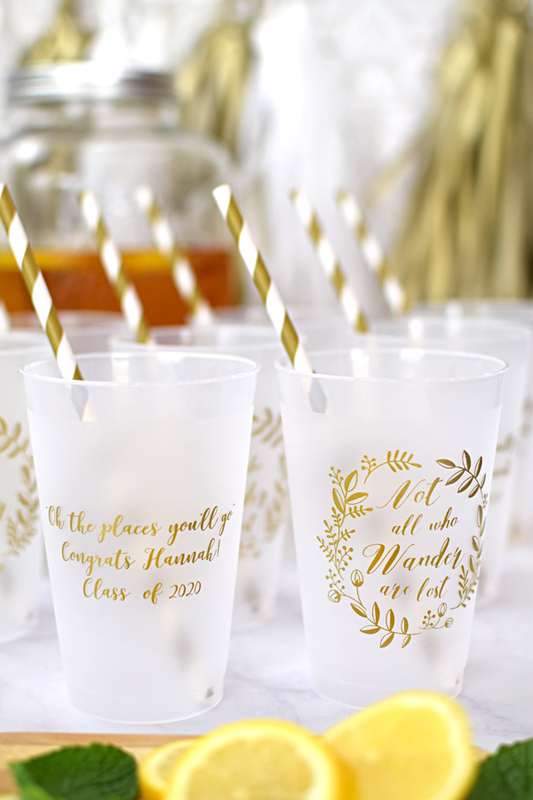 These cups turned out super cute and everyone at the graduation party loved them! The customer service person I spoke with was very helpful and made sure I got the cups on time for the party! Great customer service and quick delivery! Would definitely recommend and will be ordering again soon. Order was easy and shipment was fast! Exquisite custom made cups! Definitely, will order again and would highly recommend. Thanks again!